dis iz Elvira. She and her daddy, Manny, live down at da end ov our driveway. Manny haz to leave the country fur werkie sometimes and sometimes we finks dat he jus goes surfin(wez do not lifs neer da ocean). 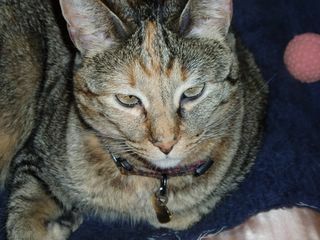 Manny came by last month an tol mommie dat he wuz gonna be gone till june and ofured us monies to feed Elvira. well mommie turned down da monies becuz mommie feeds elvira all da time, she gits mi left ofurs and beleeves me, dere r plenty ov left ofurs since i do not eats efurrything, stuff dat wood jus git thrown away. mommie jus freshes up the left ofur stinky fuds wif water and throws in some crunchies and elvira eats it up. tho recently, elvira, who does not meow, she kind of jus wines, she is a bengal and a winey wun, she wined when mommie putted sum ov mi left ofur fuds out fur her. mommie hadded to take the dish bak in, puts sum water in it and fluff it up a bit and put the bowl bak out, so den she wood eat it. she iz silly. our neighbor Paul helps us feed her too. I'm glad your human and the Paul human are there to take care of Elvira - how sad for her that her human is going to be away for so long. I am glad your Mommy and Paul look out for Elvira. She must get lonely when her owner goes away for so long. Pretty girl! Thank your mom for watching out for her!